Are you willing to wake up super early for the Avengers? We’re about two weeks away until the movie of the decade premieres on the silver screen – ‘Avengers: Endgame’. Many of you out there may have secured your tickets for an early screening of the movie via the advance ticket sales while others are still desperately finding the right cinema and the right timing to watch it. But if you’re hoping to be among the first batch to watch ‘Avengers: Endgame’ in Malaysia, there’s still hope. The only catch is, you’ll have to wake up extra early. 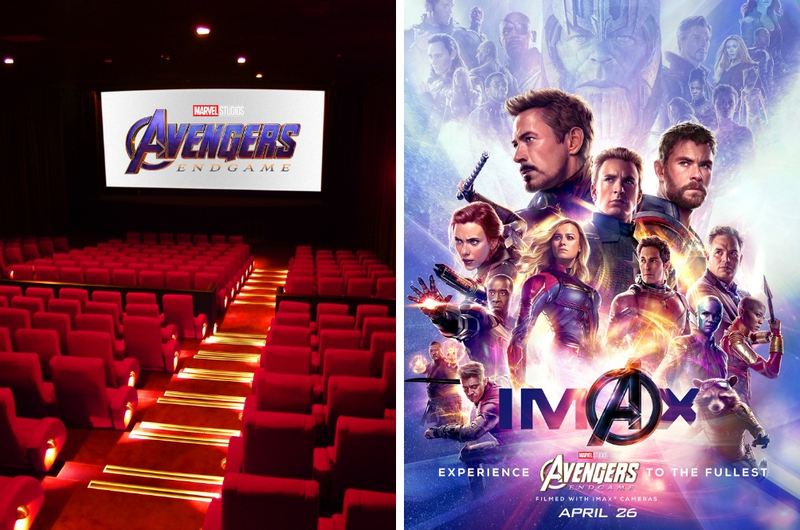 TGV Cinemas first launched their “First in Malaysia” promo on 6 April whereby you would only need to pay RM50 to catch their earliest 'Avengers: Endgame' screening at 7.30am on 24 April (Wednesday). 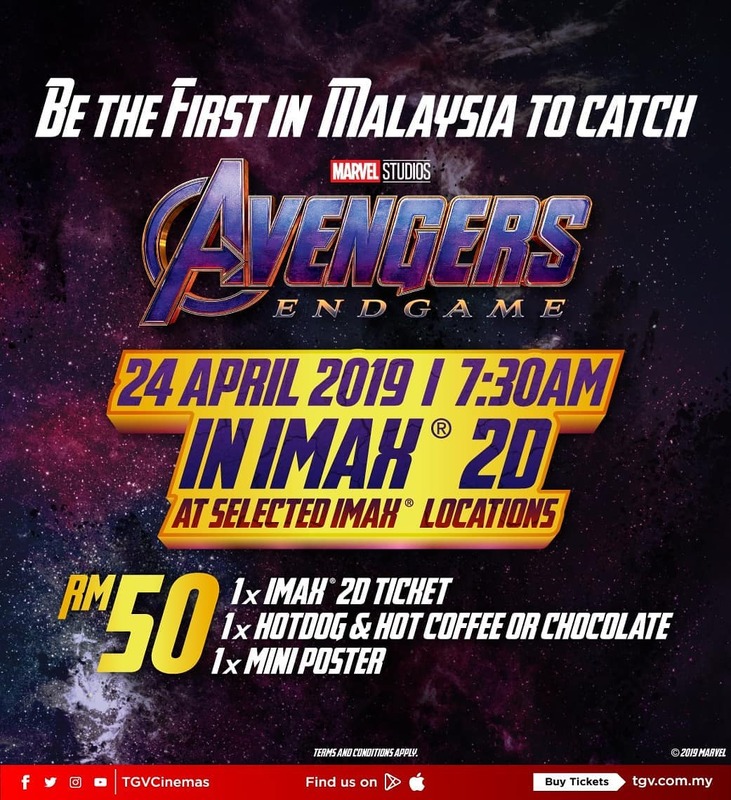 For that price, each customer will receive one IMAX 2D ticket, one hot dog and your choice of either hot coffee or chocolate, and a mini poster. You can catch the early screening at selected TGV cinemas in 1 Utama, Gurney Paragon, Sunway Pyramid, Sunway Velocity, and Vivacity Megamall. Click here to purchase your tickets. But on Tuesday (9 April), it seems that GSC Cinemas may have beat TGV in offering the “First in Malaysia” experience. You can watch the movie as early as 7.05am on 24 April at these selected GSC cinemas nationwide – GSC Mid Valley Megamall, GSC Pavilion KL, GSC MyTOWN, GSC 1 Utama, GSC IOI City Mall, GSC IOI Puchong, GSC Paradigm Mall JB, GSC Gurney Plaza Penang, and GSC CityONE Kuching. 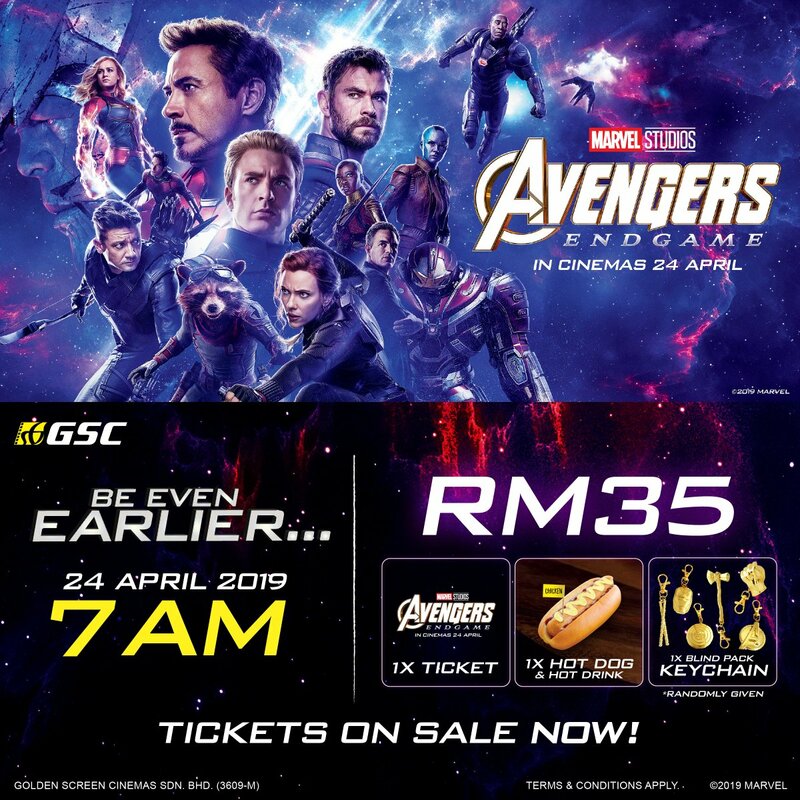 Tickets are sold at RM35, and that entitles you to receive one ‘Avengers: Endgame’ ticket, one chicken hotdog, one hot drink, and an ‘Avengers: Endgame’ keychain. Click here to find out more. So, with almost every cinema operator in Malaysia racing to be the first to screen the highly-anticipated movie, we’re now left with one question: will MBO Cinemas up their game and screen it even earlier? Maybe 6.30am? Let’s just wait and see if this mad race to become the first will take place. In the meantime, have you bought your tickets? Better hurry guys, most cinemas are almost full for screenings on 24 and 25 April!